Welcome/Introduction – Marc Morgan welcomed everyone to the meeting. Morgan shared the there was a meeting with Howard University earlier in the week to discuss various incidents in the neighborhood. As a result, a Communications Plan has been identified and will be distributed to the LeDroit Park residents and well as our Bloomingdale neighbors. In addition, a follow-up meeting took place today regarding the incident on Elm street that took place last Saturday. Howard students were having a party that went well into the night. MPD and the Howard University police were notified about the disturbance. The students left the party very late and tragically, a student was stabbed. The assailant has not identified as an HU student. 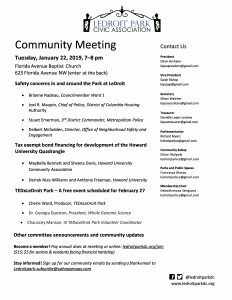 Update on Howard University/LeDroit Park Communications Plan – Dr. Heath expressed that Howard University was saddened by the recent incident over the weekend. She explained that HU has many challenges with identifying students who live off campus. Howard does not have the addresses of all the students that have off campus housing and they are asking the community to help HU identify (a) landlords who are renting to Howard students and (b) homes that are “nuisance houses” in the neighborhood. Memos will be delivered door-to-door outlining the “no nose ordinance” law in the Washington, DC which is from 10pm-7am everyday of the week. There will be an increase presence of MPD and Howard University police on weekends. No open alcohol containers will be permitted out in the open. There will be no under age drinking. Landlords will be required to register with the LeDroit Park Civic Association when they rent to students. Penalties will be given to landlords and/or students who have violated the agreement. Two or more infractions by landlords and/or students will be reported to DCRA and the Ward 1 councilmen. 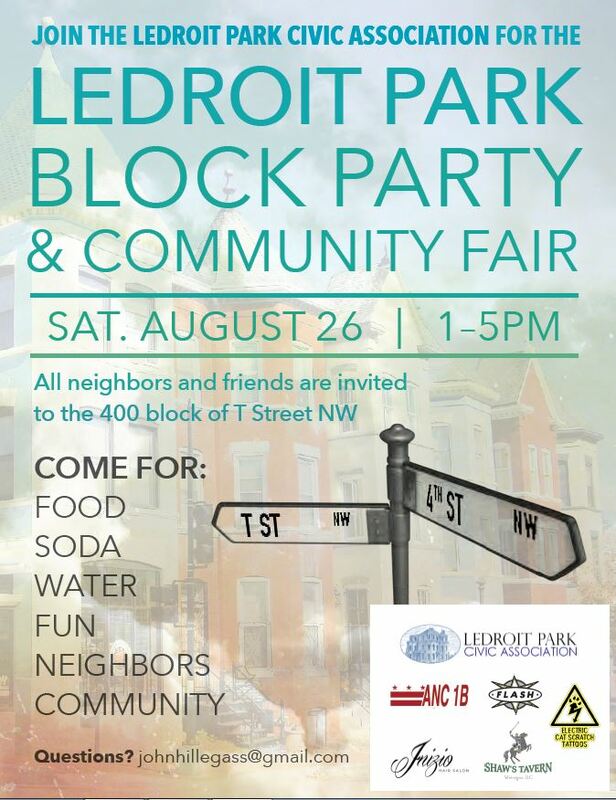 Students will be required to register with Howard University when they rent in the LeDroit Park neighborhood. Off campus students will be required to register off-campus 48 hours prior to throwing parties. There was a question regarding the development of the Harris Teeter coming to Sherman and W Street and the concern about how that will impact the Town Center. Dr. Heath was unaware of this new development but indicated she will look into the matter and get back to Morgan with her findings. 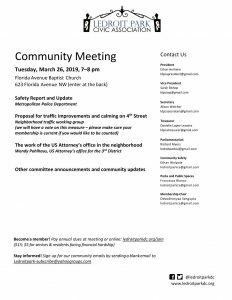 Public Safety in our neighborhood– Jana Baldwin shared that MPD stats are not available at this. Baldwin informed us that Safety Walks will be resuming soon. She encouraged all to get out and walk or bike around the neighborhood on the upcoming Safety Walk that takes place with MPD and neighbors. 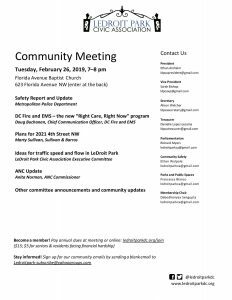 Balwind also informed us that Samantha Nolan, Neighborhood Watch Coordinator for DC will be presenting at our next Civic Association meeting. Other Updates – MPD reported that crime is low in the area but that there has been an increase in burglaries. These home invasions have been taking place during the day between 9:00 AM – 3:00 PM when most people are at work. Most buglers gained entry to the homes through the back door but in one incident the robbery took place during the day, on a very busy, well populated, street off of Florida Ave. In each case, although money may have been visiable, the robbers were after electronics such as laptops, flat screen TVs, iPads, etc. MPD is increasing officers during the day and have asked for our help in identifiying suspicious individuals in the neighborhood. They also shared that the Police Department is switching over to a new system and to be please be patient while they catch p on their incident reports. Balwind encouraged everyone to record the serial numbers of their electronics and to call 911 for all suspicious behavior. R. McGhee & Associates presented their Designs for 1869 3rd Street NW. A motion was passed to give them a letter of support for their design. September 26th, October 3rd and October 17th – HBO’s series four-part “The Weight of the Nation” at Common Good City Farm for three Wednesday’s this fall from 6:30pm – 8pm . Watching the movies id FREE and popcorn and hot apple cider will be provided. October 21st – LeDroit Park OktoberFest at the Park at LeDroit from 11am-5PM. Bring the entire family for a day of music, food, games, pumpkin carding face-painting and more! 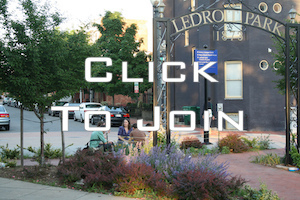 October 23rd – LeDroit Park Civic Association Meeting at the Florida Ave. Baptist Church at 7pm.